You can't leave your comment blank! Are You Sure You Want to Delete This Comment/Reply? Sorry, your comment/reply was not deleted! Just recently, as of Feb. 1st, WKUW-LD channel 40 came back on the air. When it did, they (WKUW) had replaced QVC on 40-5 with a channel of nothing but infomercials. The other change they made was just this past week when they took off Stadium on 40-3 and replaced it with a network called OnTv4U, which just airs infomercials 24/7. If there is any more news, I will post it here. After four days of being off the air, WNAB CW 58 is back on the air. It came back on the air sometime this morning. Until more news breaks, that's all for now. Thanks to the CW 58 Facebook post, the update is that CW 58 will not return to the airwaves anytime this week. However, this does not affect cable or satellite. Until more news breaks, that is all I have for you right now. Due to technical difficulties, WNAB CW 58 is currently off the air. They went off the air this morning around 7am. That is all the information I have for you right now. Below is a link to the Facebook post. I will keep you posted when they come back on the air. WKUW-LD 40 is Back on the Air, Again! Well, WKUW-LD channel 40 is back on the air again. Hopefully, for good this time. I think I saw it come on the air a little after 1:30pm. Unless any more news breaks, that is all for now. It's about time I was having withdraw from not being able to watch Quest TV. Anyone in the Spring Hill area to receive WKUW now? I used to get it before the change, now I'm still not seeing it. That's probably because when they were on channel 40 before, they were broadcasting at the highest in power they could at 15kw, but now that they are broadcasting on channel 28, they had to cut the power down from 15kw to 10kw. So, that maybe what has happened here. I was afraid something like that was what happened. I seem to be right at the edge for some of those low power stations. Oh well, it is what is. Thanks for the extra information! WKUW-LD 40 is Back on the Air, Well, They Was?! I just happen to notice that WKUW channel 40 is back on the air. It is now broadcasting on channel 28. (FYI, WNPX is not broadcasting on 28. It is, and has always been, on channel 36.) So, all you have to do is just rescan your TV and then you should be able to see channel 40 as 40.1-40.7. The channels are all the same as they were before they went off the air. Update: Right now at 3:25pm, they are back off the air. If any more news pops up, I will post it here first. WKUW-LD 40 is back on the air as of February 1st at 2:00 PM. Yeah, you beat me to it. I was just about to post it. First off, I would like to say sorry for not keeping the website up to date. If anyone noticed this past weekend, I have had the website offline so that I can fix it, but now I am back in business. Now for the business part, I just got word today from someone with the company that owns WKUW channel 40. They replied back to my e-mail saying, "I suspect based on construction schedules the station could be back on air in the next 60 days". I am hoping it is sooner to now than it is 60 days from now. Also, through various sources including Cablecutter, there has been some network changes and some new addition of networks. I am just going to list all the changes below. Until more news breaks, that's all for now. Thanks for all the updates! If only WRTN and WJDE had a better signal so us poor souls down here in Spring Hill could actually get them. However, good to hear that maybe it is just a little longer to wait on WKUW. If I remember, WJDE was going to be moving and getting a higher power. Have you heard if that is still happening and when? Yes, that is correct. They are, right now, on top of the L&C building in downtown Nashville broadcasting at just 5.3kw. They will be moving from there to a tower at the intersection of Dickerson Pk., Briley Pkwy., and I-65 just north of Nashville. Also, they will be going from 5.3kw up to 15kw. All this will happen in Phase 6 of the repack with all other Nashville TV stations that are changing channels which will be between Sept. 7th and Oct. 18th, except WNPT. It looks like WUXP channel 30 is back to full power. I have noticed on my antenna that it is stronger today like it has been in the past. I haven't seen any confirmation from the station, but just based on my own antenna, it is better. Until more news breaks, that is all for now. As most of you have probably already noticed, WKUW-LD channel 40 is off the air. I just e-mailed them last night, and I got an answer from them today. They are off the air (and will be for two weeks) so that they can switch channels. They are probably going to change channels from 40 to 28. Also, they will be going from 15kw down to 10kw. When they come back on the air, we will see how the going down in power will effect the reception. Until then or when more news breaks, that is all for now. This is helpful info, thanks. Does this mean that Channel 28 (currently ION and subchannels) will move at all? Or will the WKUW channels (Buzzr, etc.) be added as subchannels of channel 28? Starting with 28.7? Thanks! Yeah, I hear this a lot. Channel 28 (WNPX, ION) is actually broadcasting on channel 36 and has always been. It will stay on channel 36 until September or October of next year. When you do a channel scan on your TV, your TV picks up channel 36 and reads information within the signal that tells it to display it on channel 28. Yes, WKUW has been broadcasting and displaying on channel 40, but when it starts broadcasting on channel 28, your TV will read that same information and display it on as before on channel 40. I hope I have explained it well. Please let me know if you have any more questions. Any word on how much longer WKUW-LD 40 will be off the air? Yeah, I don't know at this time. I am currently trying to retrieve some information on that. As soon as I get any information, I will post it here on the website. Have you heard anything about WKUW? I emailed them and they said they were back the air and to rescan. I have tried, but I get nothing (not even a weak signal). I wonder if anyone else is getting anything or is it just me? Yeah, I don't know what they meant, because I have had no problems when they were on channel 40, but I have been watching out for them to come back on the air and nothing. I was actually going to e-mail them either tonight or sometime tomorrow. I will see what they say and will post it here on the website. What I mean by "back" is that for the past few days now, WKUW has not been working properly. If you normally receive channel 40, you probably noticed the channel was messing up this past week, but if you looked at your tv (or converter box) signal meter, you would see that the channel was coming in strong despite it looking garbled. That's because last Thursday (09/27) afternoon for a few hours, WKUW 40, WPGD 50 (rf 33), WJNK-LD 34, and WRTN-LD 6 (rf 7) all went off the air for a few hours. Before then, channel 40 was fine, but after they all came back on the air, channel 40 was like that, and as of yesterday (10/02), it is not only fixed, but they have replaced QVC with the new CBN 24/7 news channel. That is all I have for you right now. If any more news breaks, I will post it here. I notice that WKUW-LD was off as of Thursday October 4. and on WJNK-LD 34.2 there is an announcement about a new Adventist Chanel comm on November 1st. As of Friday October 5th WKUW-LD is back on the air. The owner of WKUW-LD channel 40 is buying full power station WJFB channel 44 from the TCT network. What will the programming be on WJFB? I do not know at this time. A link to the article is below. Also, if you have been experiencing problems trying to receive WUXP MyTV 30 in the past week, you are not alone. They have been having a transmission problem since last week, and they have ordered parts to fix it and will repair it soon. A link to their Facebook post is below as well. Until more news break, that is all I have for you right now. For the past couple of weeks, I have been able to receive it every now and then. I don't know if it has been the rainy weather lately or if channel 6 is doing something, but for the just past few days, I haven't been receiving at all. I will check about it and see and get back with you. Thanks. It was announced that an FCC window would be opened up for low power TV stations and TV translators to file for a new channel because of the auction repack, whether it was because they were currently broadcasting in the auctioned off block of channels (38-51) or a full power TV channel was moving to their currently broadcasting channel. That aforementioned window would be opened from April 10 to May 15, but the FCC later extended that window to June 1st. With just less than a week away, every low power station in and around Nashville affected by the auction had applied for a new channel except WRTN channel 7 that is, until now. They have now applied for channel 17 at only 12kw. Before all of this auction happened, WRTN had already applied to move to channel 17 but at the highest power level possible at 15kw. There is information in the FCC filing that gave the reason why for the power adjustment down. I am posting it below. "WRTN is displaced on it’s licensed channel 7 by WNPT, Nashville TN moving to channel 7. WRTN has a CP to move to channel 17, but it too is displaced by WHTN, Channel 16, Murfreesboro and WAAY, Channel 17, Huntsville, AL, and will receive 6.29% interference from WKSO, Sommerset KY. The only fix was to do a major overhaul of the Ch 17 as a displacement to ch 7. The current channel 17 CP will be dismissed so the displacement application can be granted. " WCKV has now chosen a new channel because of the repack. They are going to change from channel 30 to channel 22 and going from 10kw to 15kw. Unless more news breaks, that is all I have for you right now. I just learned two more bits of information about low power TV stations in Nashville. I have found out that WLLC-LD channel 42 is going to channel 19 at 15kw(14.9kw to be exact) at the same height and the same location(at the top of the L&C building). Also, I said that WKUW-LD channel 40 was going to channel 28, but sadly, going from 15kw down to 10kw and from 274m high down to just 78m, but now they have changed it. They have now applied to leave the height at 274m, but they are still going with 10kw. So maybe it won't be as much of a loss as it was going to be. If I hear anything else, I will post it here. Update: Also, I forgot to also say that WCKV-LP channel 49 has applied to cancel their analog broadcasting license. Another Update:WCKV is currently broadcasting in digital on RF channel 30(virtual 21). Since WNAB will be moving from channel 23 to 30, WCKV will soon be applying for a new channel. When that happens, I will post it here. WCKV in Clarksville is NOT going off the air. We are simply cancelling the old Analog license that was on CH 49. WCKV went digital early several years ago and broadcasts on digital Ch 30. However due to MY30 (WUXP Full Power) in Nashville using that as their Virtual Channel, WCKV applied to the FCC to use Ch 21 as its Virtual Channel. WCKV is broadcasting 4 OTA Channels: 21.1 (also on Charter Ch 6 and CDE Lightband Ch 12), 21.2, 21.3 and 21.4 (also on CDE Ch 25). Some TV's will not pick up Virtual Channels and may see WCKV on 30.3, 30.4, 30.5, and 30.6, since MY30 is using 30.1 and 30.2. Lastly, because of the FCC Auction, WCKV will need to vacate digital Ch 30 and is applying to move to a new channel. Contact Dan at 931-302-2100 for additional info or details on WCKV. I am sorry for the misleading post. I have since corrected it. Thank you for bringing this to my attention. Today is the first day of the window for low-power stations that couldn't participate in the repack auctions, to change channels. As of 1pm, there are only two of four channels that have applied. They are WKUW-LD 40 and WNPX-LP 20. I know that WNPX-LP 20 is not currently on the air. They are owned by Daystar. The reason they are participating is because WZTV will be moving from channel 15 to 20. They have applied to change channel from 20 to 24 at 15kw (the same power as WKUW 40). WKUW-LD 40, which is 15kw at the height of 274 meters. They are going to channel 28 but sadly, just 10kw at 78 meters. I don't know how that is going to play out, but I don't think its good. Until further details emerge, that is all for now. If you didn't know, a while back, The Country Network on WKUW 40.4 was replaced with the new network QuestTV. Well, thanks to RonG for the info, now the Country Network has found a home on WJDE 31.2 replacing the Soul of the South Network. So, if you have been looking for the Country Network and can receive WJDE 31, you can now watch the network on your tv again. If you can't receive WJDE, you can still watch the Country Network online on their website. Until more news breaks, that's all for now. I wish NEWSMAX and WEATHER NATION could find new homes and come back to Nashville airwaves. Be nice to have 24 hour news and weather stations OTA again! I never noticed NewsMax to have 24-hour news. Seems like late nights and weekends were always filled with black-and-white WWII documentaries. Am I wrong? I got word today that WJDE-LD 31 has been showing test patterns or even blank screens. So, I e-mailed them and got a response back. It says as follows. "We should not be having problems. Let us check into this." So, there you have it. It should be cleared up in a few days. At this time, I am unable to receive WJDE, so I will not be updating this when it gets fixed. Until more news breaks, that is all for now. I am still getting a test pattern on 31.2 &31.4. No picture at all on 31.5. I was getting a clear picture on 31.1, 31., and 31.6. Today the picture is pixillated (or breaks up). I have rescanned my set but it doesn't help. I live in a retirement high rise and connect to the rooftop antenna the complex uses. All of The channels are back as of today. Also Soul Of The South was replaced by country music TV on 31.2. So if anyone misses it on 40.4 and can get 31 it's there. 32.2 changed to Country Music tv last November and was on two channels for a while. Everything is back to normal for me too! Thanks for the info! I just discovered that the new Quest TV network has started on WKUW-LD channel 40.4. It has replaced the Country Network. I don't know much about the network, but I am looking forward to looking at its different shows. Until more news develops, that is all for now. According to the Quest-TV Website: Quest is a 24/7 broadcast television network that entertains and informs its viewers with exhilarating adventure programming about nature’s greatest dangers, history’s greatest mysteries and man’s greatest achievements. I just found out today that the Quest Network (www.questtv.com), a new network that will launch next week, will be coming to WKUW-LD channel 40. If it will start next week on channel 40 and what channel (40.x) it will be on, I do not know. When I find out, I will let you know here. Until then, that is all for now. Is the new network on the 40’s still coming? Looking forward to a new channel with my interest. Thanks for your insight! Yes, as far as I know, it is still coming. The owner (DTV America) also has a permit to start a new channel (WCTZ-LD channel 35). So there could be some other networks coming. I don't know what will be on that channel. First, in an earlier post, I said that channels that are not being repacked were going to have a period of time to modify their current broadcast specifications. Well, I just recently found out the time frame. They are only going to have 10 actual days, that is including the weekend, to do any modification. It will be from November 28th to December 7th. They(FCC) said it will be a first come first served basis. I will post any applications that are from any Nashville area stations. Second, I noticed a while back that WPGD shrunk down from five channels to just one channel. I have been meaning to post about it, but never got around to it. CompuPaul had received a reply from WPGD about the situation. I am posting it below. I want to thank CompuPaul for the reply. "The WPGD transmitter is and has been at 100% and is compliant with all FCC regulations. Including legal Id’s We are currently on the backup dish at the transmitter site. Due to this we are only able to broadcast the main channel. So the sub channels are off air. I just got off the phone with the tower crew from North East Tower. They will be here on Friday to commence work. Hopefully this issue will be resolved in a timely manner and we can again broadcast the sub channels." That is all for right now. I saw WPGD was back to transmitting all their subchannels last night. I am thankful to have them back before some Christmas specials hit the air next month. Well, today, only one application has come in so far, and that is WNAB channel 58 and WJFB 44. WNAB have applied to increase their ERP from 200kw to 725kw, and WJFB has applied to increase their ERP from 681kw to 950kw. In the past few years, they (WNAB) have been hard to keep stable at just 350kw, in my situation. If any more applications come through, I will post it here. That's all the news for now until later. The only station that applied to change their repack channel assignment is WTVF NewsChannel5. Their repack specs for channel 36 was already for 1000kw. So, the only change they did was to change from an elliptical antenna to an Omni-directional one. That is all for now. The only station to apply to change their repack specs is WNPX 28. The only change they have done is to increase their ERP (power) from 676kw to 1000kw. I have updated the repack plans page. That is all I have for you right now until later. Well, I just wanted to post this real quick. I just happened to go through the channels and I happened to come across Grit now on WKRN 2.4. I just thought that WTVF NewsChannel5 would put it on 5.4 because Scripps, WTVF owner, is now also the owner of Escape, Grit, Laff, and Bounce. Well, that's all for now. Another Nashville station has applied to change their repack channel specs. WJDE-CD channel 31 has applied to change the power of their new channel 23 from a mere 4.45kw to 15kw. That is the highest power they can go. Now that should really help in their coverage and everybody's reception. That's all for now until later. I really hope so, I've never been able to pick it up. News broke last week from the FCC that just like the filing window that is open now until Nov. 2nd for the stations in the repack to file for modifications, the FCC has decided to create another filing window for the stations NOT in the repack to modify their broadcasting specs. That window will be between Nov. 2nd and Dec. 31st. That date is not set in stone. They just said that it would be after this current filing window closes. Just to clarify, the stations in Nashville that would fall in that category would be WKRN 2, WSMV 4, WCTE 22, and WPGD 50. What they can do is to either move their transmitter or power up. Both WKRN and WPGD can only move, because they are already at full power. That is all the information I have for you right now, until later. Between October 3rd and November 2nd, stations that are involved in the repack that is coming up are able to change their repack specifications like either increase their ERP (power) or even change channel. The first application that has come out for the Nashville area is from WHTN channel 39, currently RF channel 38. It is currently holding a permit for channel 16 at 618kw. They have applied to increase ERP from 618kw to 900kw. I have made the changes accordingly to the repack plans page. You can click here to go to that page. I am awaiting more applications for the other stations in the repack in the next coming days until the deadline November 2nd. WJFB, awhile back, didn't apply for a construction permit for their repack channel 25, because their current tower (located in Wilson County) wasn't able to support a new antenna for channel 25. So, the plan was going to be to move to just north of Nashville and broadcast at 1000kw, but they have just applied for their permit, and they say they have done some structural work on the tower, and it is now able to support the new antenna. Therefore, they have applied for the specs the FCC has given them, which is, to broadcast channel 25 from their current location at 681kw. I have updated the repack plans page. You can click here to go to that page. Well, that is all for now. The recently new network from Mark Burnett and Roma Downey is now in Nashville on WJFB channel 44.3. You can click on the website here. That is all the information I have for you right now. Big News! Could there be Fox 28 and Independent 17? You're probably, right now, scratching your head over reading the headline. What I mean by the headline, is that there is an article that came out today, link below, that says 21st Century Fox is in talks with ION Media Group to run all 60 ION owned & operated stations including our very own WNPX 28. The article also says that this deal would pave the way for Fox affiliation to leave Sinclair stations including WZTV 17 in which it says the Fox affiliation agreement with Sinclair stations are up for renewal this year. So now you see where I came up with the headline. I do have to say that this is all in talks and not a done deal. This could all fall through. If this does go through, this will be the first time Fox will not be on WZTV 17 since 1990. Please comment to let me know what you think. That is all the news I have for you right now. We shall see. If this is the case, all those Sinclair holdouts with cable and satellite companies over the years will really look bad. If Fox moves to WNPX WZTV could do several things. 1 Go Independent and increase their hours of news. 2 Get the CW from WNAB 3 affiliate with either CBS, NBC, or ABC. Sinclair Broadcast Group (owner of WZTV 17, WUXP 30 and operator of WNAB 58) and Nexstar Media Group (owner of WKRN 2) have made an agreement to rollout a transition for ATSC 3.0. For people who don't know ATSC 3.0, it is the next generation of TV broadcasting. It improves on signal penetration through walls, allows UHD or 4KTV being broadcasted over the air, mobile broadcasting, and much more. What this agreement means, is that let's take WZTV 17 and WKRN 2 for example. WZTV and WKRN will simulcast on each other's channel. Since WKRN has nothing to do for the upcoming spectrum auction and while WZTV will have to change broadcast channels from channel 15 to channel 20, IMO, it looks like the easiest solution is for WZTV to upgrade their equipment for ATSC 3.0 and broadcast both WKRN & WZTV in 3.0 on WZTV's new channel 20 and also broadcast both WZTV & WKRN on WKRN's channel 27. Again, that is just my thinking. I am posting a link to the article below. If you have any other ideas, let me know by commenting below. E.W. Scripps Co. (owner of WTVF NewsChannel 5) has bought four diginets - Bounce, Escape, Grit, and Laff. What this will mean for the networks here in the Nashville market. I don't know. IMO, they(WTVF) will probably add Grit back to the Nashville airwaves after being "shoved off" of WNAB by Sinclair. As for the other networks, who knows. I am posting a link to the article below. Actually, Bounce already broadcasts over the air on low power WLLC channel 42. I have combed the FCC auction filings and have cumulated all of the information for the Nashville TV stations that are affected. There are a few things that will surprise you about some of the TV stations' plans for the repack. There was just too much information to post here. So, I have dedicated a page with all of the information in a nice table. Just click the link below to see it all. I will be keeping it up as new information becomes available. Well, that is all for now. I hope WJDE will be able to increase power eventually so more people can pick it up. Glad they are moving from downtown anyway. How soon would we be able to watch these channels start doing their equipment test? As far as I know, they can't do any of the testing of the new channel until September to October of 2019, then they have to switch to their new channel permanently in the middle of October 2019. Except for WNPT. They will have to wait until Spring 2020. First, I would like thank Brentwood OTA for this information. The full PBS Kids schedule is coming this summer to WNPT 8.3. If you live anywhere near the Upper Cumberland area, you probably already know and have seen PBS Kids via WCTE channel 22 Cookeville. They have been airing PBS Kids for a while now on 22.4. If there is any more news, I will post it here. Good for them! PBS Kids debuted on WKNO in Memphis back in mid-January. I found it on 8.3 about 2 this afternoon. It didn't take them long to start airing it. I just noticed I have it! I scanned earlier today a noticed I got Channel 40 back, but I overlooked 8.3. PBS Kids is great, but would but nice to see a weather channel again!!! any word on why fox removed weathernation? Well, you see, Sinclair (the owner of WZTV & the owner of TBD) decided they had to put their own network somewhere. So, since they didn't own, or didn't care for, WeatherNation, they took that off and put on TBD, which in my opinion is just a waste. I know that it is a religious channel, but still, it is a new digital channel over the airwaves in Nashville, and I was just wanting to let everyone know about it. It is being broadcasted over the air on RF channel 34 from the intersection of I-24 and Old Hickory Blvd. north of Nashville, a.k.a. the Nashville antenna farm, at 15kw (the same as WKUW-LD 40). It started broadcasting just before 5pm this evening. That is all the news I have for you right now. It's hard to believe it is on the same antenna. I get an excellent signal on channel 40 but channel 34 barely comes in and the signal drops out so much to be almost unwatchable. It's barely better than channel 6 with their reduced power. I just got Channel 40 back today. Both are coming in great right now, but I know it's subject to change. I'm getting 34 great, but 40 has regular dropouts at my location. You're right. Channel 40 just dropped out again. Thanks to CompuPaul for the update, he got a response back from WRTN. In the e-mail he got, it says, "Yes. We got hit by lightning and it damaged both amplifiers. One is fixed and waiting on parts for the other so we are at 30% power. " So, there you have it. If you are like me and haven't been able to receive WRTN, then that is the reason why. Again, I would like to thank CompuPaul for this. Actually, the reason the Luken Channels (RetroTV and Jewelry TV) have vanished is because the satellite that Luken used has failed. They are now on a new satellite. Now, it is up to WRTN to realign their satellite dish to the new one. I heard this happen to the affiliates in Phoenix. I am really hoping that this is the reason why RetroTV has been freezing up. Now that it is on a new satellite, maybe it won't freeze up. You may already know this by now, but if you don't, two new networks have replaced two other networks. Sinclair's own TBD and "Charge!" have replaced WeatherNation on WZTV 17.2 and Grit on WNAB 58.3 respectively. For me personally, in my opinion, I don't mind Charge, but TBD, as far as I know, is nothing. As for the networks they replaced, Grit was ok. I didn't watch anything on it, but about WeatherNation, I used that to see the current radar when I watched tv and to see the weather videos they showed from time to time. Please let me know in the comments section what you think of the network change. That is all I have for you right now, until later. Personally, I'm ticked at the removal of weather nation. Please find out if it can be brought back! Doesn't surprise me that WeatherNation was replaced. I liked Grit. It doesn't surprise me that these two new networks were added. I am hoping one day a more reliable outlet will steal Retro TV from WRTN. One that won't go off the air or freeze up all the time! I'm generally for the little guy, but at this point I think you're right on Retro TV. WRTN being off for weeks at a time, outage reports often get no response on what's going on or when they hope to be back up. I would love it to go to a reliable station. I enjoyed some of Grit's programming. I will have to watch Charge to see if I like it or not. I'm hoping Grit moves to another station. I don't understand why American Sports Network is on 2 different channels. Maybe Grit could replace one of them. As for TBT, it seems so far to be a waste of a subchannel (as interesting as Revn and True TV). I wish Weatherscan was still on. I used to watch channel 2's weather channel all the time, was a much better format for seeing what's happening locally. Weather Nation was okay but rarely watched it. I'm not seeing anything on TBD that I'll be tuning into over the next week. Grit would occasionally put on things I'd record for my mom. I looked over programming for Charge! for the next several days. I didn't see anything I'd watch (maybe Boomerang cartoons, but not on at a convenient time for me). I hate both channels. TBD = Television Be Damned. Not only should they bring both channels back, but I want most of the networks currently on WJDE (Channel 31). Time out for one subpar network plus five HSN/QVC subchannels. I just got an e-mail from the WRTN owner. He said, "We are having transmitter issues which we are repairing." So, if anybody has been having problems trying to receive WRTN channel 6, that is why. Also, if you have noticed, WJFB channel 44 has been having equipment problems. Up until last month, they haven't been broadcasting at 1000kw. With the equipment problems, they had to reduce that to just 314kw since then. They will have to stay there until they have fix it. That is all the news I have for you right now until later. Other than RetroTV, I hadn't noticed any prolonged issue with WRTN. (Of course RetroTV is the one subchannel I really want on 6). However WJDE, 31, hasn't been coming in at all for me for a few days now... I'm on the fringe of reception but I can normally get at least intermittent blips, especially over multiple days. Anyone else? For the past few months, it seems that WJDE is off the air for a couple weeks, then they will be back on the air again for a couple weeks....until they go off again. As far as I've been able to determine, there's no phone number or website to contact them and find out what's going on. It's very frustrating. WJDE is back on the air as of today. Anybody's guess as to how long that will last though. Tuesday, May 16 at 5 pm I got my first good recording from WJDE, 31, after their latest problem. WRTN, 6, I still have no reception at all (I have had weak audio on rare occasion when scanning through). Verified amplifier appears to still be working, other weak stations coming in well, so it would seem to be broadcast related. And... WJDE 31 appears to be off the air again starting yesterday. *:-) And it returned again today. Got a brief but degraded recording from WRTN last Saturday, then weak or no signal after the storms for the rest of the week. Tonight I'm getting "Mode Not Supported"... whatever that means for a TV channel. The Final Channel Reassignments Results!!! The auction results are out!!! I am posting all Middle TN's results below. Also, I am posting a link to RabbitEars.info's page to all the results as well. Updated: I have found and added what the FCC is allowing the changing stations to broadcast at. Now, they might be allowed to increase that down the road. I am putting both current and future ERPs so that you can compare them. Do you know if WJDE will be increasing power, or moving to the Whites Creek area transmitters? Thanks! I thought WJDE was going to try to get more power after the auction, not drop it. Any word on WRTN? Of course, you already know that WNPT channel 8 is moving to channel 7 and that WKRN (News 2) RF channel 27 is staying on 27 as well as Cookeville PBS station WCTE staying on channel 22, but I have found out today, some more results. Besides WKRN, WSMV channel 4 and WUXP MyTV 30 are not changing channels. Others I have listed *all channels* below. At this time, I do not know anything about WNPX 28, WJDE-DC 31, WHTN 39, WJFB 44, or WPGD 50. I found all this info out thanks to this link: NAB TV Repack. If I find out any more information, I will post it here. Why is WJDE 31 off the air more than they are on the air? IF they are actually on the air, one or more channels will frequently be broadcasting without audio. Does the owner even monitor his channels?? I have been unable to find a Nashville phone number, email address, or website. The best I have been able to obtain is a Kentucky phone number of the owner but that always gets me to a voice mailbox only. Yes, WJDE appears to be owned by WBNA out of Louisville. Only email contact I have found is Tom Fawbush <tom at wbna21.com>. He normally replies within a couple of days. They have had issues in the past, e.g. someone repeatedly telling GraceNote that they have some alternate channel lineup than what is actually broadcasting, even when given pictures of what is on with channel number shown. Oh wow. I just recently re connected one of my antennae after a year-and-a-half hiatus and was planning on trying to make some simplifications and improvements to my system at my home near Cookeville. TV Fool would not give me permission to post about a UHF/VHF combiner question even though I was already a member, so I was researching for some help and found this site. This is great! I didn't know about the upcoming RF changes and I think I'll just hang tight for a while. I'm currently getting 9 out of 11 UHF signals right now with a bow-tie UHF antenna pointed near due west with the cabling that was still under my house from before. I'm going to leave it alone; except maybe combine my VHF into my line and try to pickup 4 (10) and then just see what happens after all these changes take place. Anyway, thanks for being here! I just got word from WKRN GM. He said that WKRN (News 2) did not participate in the auction and they are staying on channel 27. By the end of the month, American Sports Network (ASN), which is on WNAB 58-2 and WKUW-LD 40-3, is shutting down operations. What this will probably mean is that TBD and Charge!, which are also new Sinclair networks, will finally have a home in Nashville. As for which one will take the spot, I do not know. They could even shuffle subchannels around and put TBD or Charge! on another subchannel. I have posted links to some articles about this below. When more news breaks, I will post it here. If you didn't know already, there has been a spectrum auction going on that just ended last week. The outcome of the auction is that channels 38-51 were sold to wireless companies. Therefore, most, but not all, TV stations participated in the auction. Some are not affected, some are having to change channels, some are going off the air and "piggybacking" on another channel, and some are going completely off the air. All information regarding channel changes are to be released by early April, but over on Rabbitears.info, there's a page devoted to what station is doing what, and I just found out via the "PBS Station" link on that page that WNPT channel 8 will be moving to channel 7. What this means for WRTN-LD channel 7, I don't know. Also, there will not be a change for Cookeville PBS WCTE channel 22. When I find out more information, I will let you know. 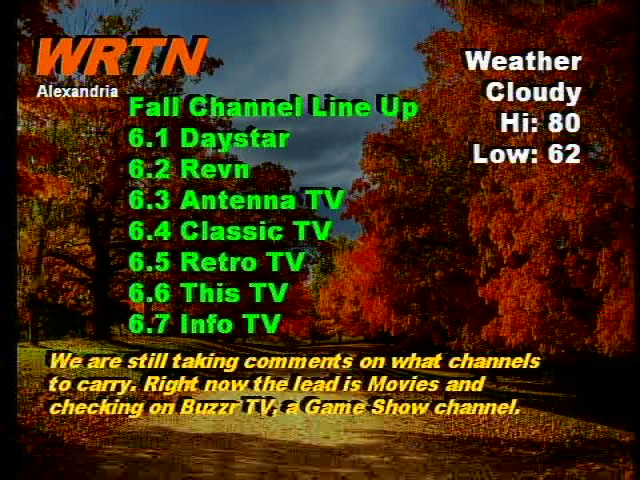 Thanks to Paul, I have an update on WRTN 6.5 (RetroTV). WRTN owner said he was having dish issues with Retro, and that he was trying to fix it. Also, he said he was bringing back Rev'n as well. I would like to thank Paul again for that information, and whenever tv news breaks, I will post it here. Tonight 6.2 is black (was Jewelry TV, so not a great loss), and 6.7 (RetroTV) is frozen. Sigh. Wrote to Rick Goetz and Chris Waller. Hopefully someone can fix it soon. I know that most people don't think about this station all that much, if at all, but awhile back, they had a permit for a digital channel 28 at 13.3kw in northern Davidson County on the same tower as WNPX, WPGD, and WKUW-LD. That permit expired on Sept. 1, 2015. Now, just today, they have applied to just 'flash-cut' to digital, which means that they will turn off analog channel 34 and turn on digital channel 34 at 15kw, the same power as WKUW-LD channel 40. As of today, they are still broadcasting analog channel 34. Until further news breaks, that's all for now. I have heard from several people that they are having trouble receiving WJDE-LD channel 31. I, personally, have never received and am unable to ever receive channel 31. So, I had e-mailed a person related to the station, and they replied back to me. Below is the response I got back. "Yeah we're having some signal issues today. We hope to have them resolved tomorrow. Stay tuned." I've been having problems receiving them too, but I'm on the fringe of being able to receive them anyway. Any minor thing will cause it not to come in. Glad to know it isn't just me and that WJDE is on it. WJDE is back on the air. It went off sometime around the 16th. or 17th. and came back on the air this afternoon. A new network is coming to Nashville via the Sinclair Broadcast Group, which owns WZTV Fox 17, WUXP MyTV 30, and runs WNAB CW 58. The new network will be called "TBD". The name does stand for "To Be Determined", because it will be mostly comprised of digital content whether it is viral videos, sports, or anything else from online and digital content providers. It will be coming on early next year. Which channel it will be on, I don't know at this moment, but when I do, I will post it here. You can read more at the link below. Until later, that is all I have for you. I'm wondering if this could possibly go on 58.2. I don't understand why ASN went on 40.3 unless it is leaving 58. I hope this network shows up somewhere anyway. Here we go again. WRTN has made some changes to their channel lineup. 6.2 is now Jewelry TV not Rev'n, 6.5 is RetroTV again instead of a frozen/blank screen, and 6.7 is the classic movies channel instead of EbruTV. I don't know how long these changes will last, but I am glad that RetroTV is back. I am listing the lineup below channel by channel. ""Channel will not confirm changes" is the response that I just got from our upstream. If the station won't confirm the new lineup with Gracenote then they're not going to make updates." They never responded to the changes in September either. Anyone have a contact with the station? Why would they not want to confirm lineup changes they made? Since WRTN still hasn't confirmed either their previous or current lineup yet, I have done a workaround for MythTV. I added Huntsville WMJN 29.2 (first affiliate I saw in central time zone) to my SchedulesDirect channels. Downloaded the XML file, found the station ID is 92429, and in Myth setup mapped 6.5 to 92429. Non-tech savvy folks wouldn't have a clue how to work around it. Shouldn't be necessary. I just saw on Facebook that Heartland already has a home. It will now be shown on WLLC-LD channel 42.4. I don't know about anyone else, but I cannot get this channel at all. So, please can someone comment on this and let me know if it is on or not. So, below is a chart of what has happened over the last couple of days. I can confirm 4.2 is now Escape. I can't get a picture or sound on 40.3 but the guide shows Escape as well. As for 42.4 I can't see it at all. Well, there has been a switch among Nashville subchannels. I previously posted that ASN is on WKUW-LD 40.3. Then, what happened to Escape? Well, it appears they moved to WSMV 4.2. If that is so, then what happened to Heartland? I don't know, but for now, ASN is on both WKUW channel 40 and WNAB channel 58. That is all I have for you right now. I just received word that WKUW-LD channel 40.3 has been changed from the Escape network to the ASN (American Sports Network). I don't know this for myself because I cannot receive this channel, but if it is true, I don't have any idea why they would go with another network that Nashville already has, just like QVC. Please leave me a comment and let me know what you think about this change up. That is all I have for you right now. NPT 8 is Back on the Air!!! I just checked and WNPT channel 8 is back on the air. I know this maybe the shortest post, but other than that, that is all I have for you right now. Just thought I would give you an update on WNPT channel 8. Right now, it is still off the air. The comments below are from Michelle Jones from WNPT. The first one was posted on the WNPT website just yesterday (10/22). I checked with Mr. Crane and Mr. Baker before posting, but here is an engineering response: NPT’s transmitter tower, like many towers in the U.S., is more than 40 years old and in need of refurbishing. There are only a few crews in the country qualified to do this high-altitute work, and they go from state to state working on towers and antennas and responding to emergencies such as fallen towers, which does happen now and again. The crew working on the NPT tower started by checking all the high-tension guy wires holding the tower up and replacing any corroded parts. Then they started climbing the tower and checking all the joints, replacing rusted and corroded bolts and sections. As they got closer to the top, NPT’s transmitter power output was reduced and finally turned off for the safety of the workers. The next task was to remove the old WKRN analog antenna from the top of the tower, as it was no longer in use. This changes the towers height, which meant that all the lights on the tower had to be moved to comply with FCC & FAA regulations for tower height. Finally, the tower will get a new paint job that will, with any luck, prevent corrosion and keep the NPT tower in good condition for another 40+ years. The second comment was posted Tuesday 10/18. We cannot state when our signal will be further available to all our viewers because the length of the maintenance depends on a number of factors beyond our control–one of those being the weather–but we are hopeful we will be back on the air for everyone within 10 days. That is all I have for you right now. Are WKRN and WNPT still sharing the dame tower and if so is WKRN operating at reduced power? No, they're not. Only the WKRN old analog antenna was on the same tower as WNPT antenna. In another comment on that page, she said they (WKRN) was on a neighboring tower. So it doesn't have an effect on WKRN. WNPT channel 8 has been off the air since yesterday morning. They are having tower maintenance done, and they will be off for another week. A link to the story is below. That is all I have for you right now. Well, there has been another network added to the WRTN lineup. This time it is yet another shopping channel on WRTN 6.6. It is called Evine. You can find out all about it by going to their website at www.evine.com. The reason I said "yet another" is because Nashville already has the two major shopping channels - "HSN" and "QVC", and they are being broadcasted twice over the air with HSN on both 28.6 and 31.x while QVC is on 28.5 and 40.x, and an extra QVC on another 40. Also, there is the Liquidation channel on 40.2. So, counting the duplicates and the new network added, that is seven shopping channels on the air in Nashville. In my opinion, enough is enough of these shopping channels. That is all I have for you right now. Well, not only is This TV back but Retro TV and Rev'n are back as well. Retro TV is now on 6.5. I am posting the channel lineup below. If anything else happens, I will post it here. I really wish the station managers of these smaller stations would let the listing service know before they change channels around. It plays havoc with auto-recordings, and takes at least a week to resolve, during which time the wrong things will record without major intervention (which has to be undone once it is fixed). Tonight: 6.2 is black, no surprise, often does it. 6.5 is black, hopefully return to RetroTV. 6.6 is evine, yet another shopping channel... Rest are as listed. I got word earlier from the station owner that This TV will be back on the air soon. So, don't fret. It's coming back. The response I got back I will post below. That is all I have for now until later. "Will be back on the air soon. We have parts coming and will try to get it back up." Thanks for the info. I'm glad it's back on, but I wish he would've replaced REV'N with the movie channel he had. Any word on Retro TV coming back? What Happened to This TV? If you haven't noticed, This TV has disappeared from WRTN channel 6 altogether. He, the owner, has now replaced it with his own movies channel, which has been off for a while. I will try and get in touch with him and see if This is gone for good on his channel. If I get a reply back, I will post it here. That's all for now. This channel frustrates me so much. Retro tv has been frozen for weeks and now This tv is gone. I enjoyed them while they were there. I guess ebru will disapear next. I wish someone else would broadcast Retro and This if these folks can't do it. Thanks. This TV disappeared several days ago with "No Signal" being displayed. Very disappointing. We really enjoyed it. I hope they bring it back. Thanks for the update. Well, it's that time of year, where we go from summer to fall. Which not only means that the regular TV season begins with the four major TV networks soon, but it also means new schedule changes to the little guys, a.k.a. diginets. Yes, I know that these networks (MeTV, AntennaTV, H&I, RetroTV, etc.) change every now and then, and I don't usually post about it, but since there hasn't been that much news lately here in and around Nashville and that all these networks are changing their schedule this month (at the same time), I thought I would post about it and see what your thoughts were about the changes and about the new TV season coming up. I am posting links to each networks new schedule below. Some of them are PDFs. So, be able to have your Adobe Acrobat Reader ready and up to date. I tried finding Cozi's new schedule, but I couldn't, but when I do I will add it on here. If there are any networks (mainly old tv show networks) changing their schedule this month and I didn't post it here, just let me know. That's all for now. Thanks tomintn for the links, but the Cozi schedule was just for the month of August. They will have a new schedule over the next three weeks including new shows coming to Cozi like "Little House on the Prairie", "Frasier", and "Quincy, M.D." Also, that Antenna TV PDF is not the new schedule that is coming by next week. Well, I finally have upgraded the website. I mainly wanted to make it more modern looking and mobile friendly and responsive. I have made it to where when you post or edit a comment that you can do that instantly. Also, the comment section of each post is hidden below the post. If there are any comments, just click on "Show Comments", and it will pop right down. I have also added two new features. I have added to each comment a reply section. So if you want to reply to someone's comment, just click the reply link to that comment, and the other feature is that each member can now have an avatar. All you do to add one is go to the settings page in the upper right corner when you are signed in. If you are a member and have received your new temporary password, please, as soon as possible, sign in and change your password for a better security measure. I have done away with the digital channels received page because I never did keep it up to date. So, I have replaced it with a links page. The links are all related to either tv news or digital tv reception. I hope you all enjoy the new website. If you have any comments, please leave them below. Let me know how it looks. Thank you. The site is a big improvement! Thanks for this, and all the news & info you pass on to us. Appreciate your site and info. Enjoy keeping up! I was just flipping through channels when I came across WRTN channel 6.7. It is now showing the ebru network. It was showing an episode of Doctor Who with David Tenant. I checked out its website at ebru.tv, and it has shows that are of recent, maybe the past decade, like Doctor Who, Robin Hood, Sue Thomas FBEye, Played, and more. Also, for a side note, Daystar is no longer on WRTN 6.1. It is now a black screen. I don't know if Daystar not being there is permanent or just equipment problems. I don't know, but that is all I know right now. I noticed Daystar being gone this morning also. This happened about the same time I noticed EBRU appearing. I am assuming it is equipment problems as that seems to happen sometimes. we'll know in a few days. June 21, 2016 7:00 AM ------> Channel 6.1 - Daystar, 6.2 - REVN, 6.3 - this TV, 6.4 - ClasTV, 6.5 - TUFFTV, 6.6 - retro TV, 6.7 - ebru. Happily all appear to have strong signals in the Mount Juliet/Hermitage area. This is good news. Also, all of the 40's are working and have been for a few weeks. Daystar returned yesterday. I've noticed channel 6 loses a channel temporarily once in a while. Yes, they do occasionally. RetroTV (and now Rev'N too) seem to have more trouble than most. Last time I got a response, Rick Goetz said RetroTV was broadcast out of Chattanooga and they had bad weather. I know probably by now everyone who receives WRTN channel 6 already knows about this, but for ones who can't receive WRTN, the channel lineup is pretty much the same except for 6.5 and 6.6. 6.5 was RetroTV. Now it is his own westerns channel. RetroTV has now moved to 6.6 where TuffTV was once was. Now, TuffTV is gone from the lineup. Why did this happen? How long will it stay like this? I am going to try and found out. If I do find something out, I will post it here. Until next time. I was near Nashville today with my portable dtv and saw what was happening with WKUW channel 40. I saw that NewsMax is gone, and they have moved up Country network to 40.4 and QVC to 40.5. Also, I don't know if they have a time delayed feed of QVC on 40.5 or what, because they also have QVC on 40.6 which matches QVC on 28.5. It does say, "Previously Recorded" in the upper left corner on 40.5. So, I wonder if that is just a fill-in until they get some other programming placed there. Also, I want to say thanks to Keith for keeping me updated. That is all for now. I had just happened to notice the changes on channel 40. I hope it isn't permanent. However 40.5 is QVC+ and 40.6 is QVC. I checked and QVC+ is a network showing previously recorded QVC programs. They have a live feed of QVC+ on the internet. I hope this isn't so but I'm afraid we have gotten another usless channel. Thanks for the info about QVC. kpople: I live in Hermitage and 90% of the time, I cannot get channel 4 (3) & channel 8 (2). If you don't mind, please advise as to your antenna? Thanks! Yes, you heard right. There is now a channel 40.5. It is called "The Country Network". It is another country music or music-related network. It has a website at tcncountry.net. Like the NewsMax website, they, too, allow you to watch a network feed live online. I am now hoping if they put on a channel 40.6, that it will be a really good channel, of course, once I get back to receiving the channel. That is all for right now until more news breaks. Maybe coincidence, but I used to get 40.1 clear and now it loses signal frequently. Did they lower power per channel by adding the additions? No, they wouldn't lower power to just add on the new additional channels. I don't think they have lowered the power at all. I think it's problems with their transmitter. It constantly freezes up here with a signal strength of 85. This happened also when they added Escape. Hopefully they will get it corrected soon. As far as I know, they didn't. In the past few days, they have had problems with some equipment, but they have since fixed that. So, unless someone else can comment, I don't have any new information about it today. Thanks for the update, as I currently cannot receive WKUW channel 40. I will be posting this soon. Thanks for the update. I actually was near Nashville today with my portable dtv and saw all of it. I will be posting all about it shortly. First, I would like to thank tomintn for letting me know about this, because I currently do not have access to WKUW-LD channel 40, but they have now added a 40.4. It is the NewsMax TV network. They are pretty much all about the political side of the news. It is a 24/7 news channel. If you are like me and can't receive channel 40 and you want to see this new network, you can click here and watch their live stream of the network on their website. Well, that is all I have at this time until more news breaks. See ya later. Most of the times, I just post about the TV signals, but I thought I would pass this along. I, myself, would like to thank Lisa Patton for all the years she worked to keep all of us informed about the severe weather when it happened. I wish her a great retirement. There is an article on the WKRN website about her. I have posted it below. She will leave the airwaves this July. I'm sorry it took me so long, but I finally got it uploaded. Below is the video of the switch from the Nashville WX channel to MeTV. You can clearly see by the clock on the weather channel that the switch took place at EXACTLY midnight. Just so you know this video was not edited in anyway. This was the way it actually broadcasted. Your browser does not support this tag. MeTV is On the Air as of Exactly Midnight!!! I saw when it changed over to MeTV, and it sort of surprised me how clean the changeover was. I recorded it, and I will post it here on the website soon. That's all for now. In related news, 31-1 is currently H&I. I hope they can make it stay this time! (Previously they said they were unable to work out contract problems.) I also hope they will get the listing services updated soon! I Love MeTV, but do hope that Nashvillewx is put on a sub channel. WZTV has weather on 17.2 but it isn't constant local. It cycles through national then local. Thanks for posting the official response from channel 2. I will miss being able to see all that information on channel 2 at any time. I was afraid that was the decision when I saw, in the last 24 hours or so of weather on 2.2, they recommended people see their websites. I may be blind, but I'm still not seeing all the information from 2.2 on their web site. E.g. actual high and low since midnight, measured rainfall, etc. It was nice to know. I have learned that WKUW-LD channel 40 has a new network. It is the Escape Network on a new subchannel, 40.3. I don't know much about it, but you can click here to go to their website or go to their Facebook page here to learn more about it. Well, it looks like its over. What I mean is about the merger fight over Media General with Nexstar and Meredith. After the Meredith merger was terminated, Nexstar has agreed to buy Media General. I hope this doesn't mean anything for MeTV coming to 2.2. I hope it still is coming this Monday. I have posted links to three articles on this news below. If there is anything else, I will post it here. My TV had picked up 40-3 existed by last night, but all 40-x channels were blank late last night. This morning, 40-2 (Liquidation Channel) is coming in perfect but still black screen on 1 and 3. 40 had all three subchannels working again by Thursday night. WRTN is Upping the Power!!!! What I mean by that is he, the owner, has filed for an increase in power. An increase to 3kw (3,000 watts). The thing is, he has filed the increase under WRTN-LP Analog channel 6, not WRTN-LD Digital channel 7. So, I don't know if he is bringing back the analog channel or he accidentally filed it under that channel and meant to do under digital channel 7. Since analog channel 6 is not even on the air, I am to believe it was meant for digital channel 7. If that is so, when he changes it, I will update with a new post then. Once the application has been granted by the FCC, he can, at anytime, increase the broadcasting power. That is all I have for now. I just received a reply back today from WKRN. They said they have fixed the channel bug in the bottom right corner of the screen on 2.3 to reflect the channel it is on. So, I am taking it that MeTV will be coming on 2.2 beginning around Feb. 1st. Titan TV schedule is showing the MeTV lineup on 2.2. It is on the channel guide in some parts of the schedule right now. I don't know why they are doing this, but I am really looking forward for it to come. That is all for now, folks. I am VERY excited! I have been writing and begging MeTV to be on a high powered station for a couple of years. And now it looks like it is happening. I am somewhat hoping they'll move their weather channel to 2-4. I would really hate loosing this valuable channel. It's now confirmed on the MeTV website that MeTV is coming to WKRN 2.2 on Feb. 1 :-) http://metv.com/wheretowatch/affiliate/659 I'm hoping that they'll keep the weather channel on 2.4, too. Thanks to Alaska1 for pointing this out, They (WKRN) have been putting a channel bug at the bottom right corner of the screen on the Justice network on 2.3. The thing is, it says WKRN 2.2 instead of 2.3. Both I and Alaska1 are wondering will that mean Justice network will be moving to 2.2 and MeTV will be coming to 2.3? I don't know, but I will try and find out. If I hear something, I will post it here. I sure will! By the way, I never did hear anything back from my e-mail to WKRN about whether MeTV would be showing up on 2.2 or 2.3. So, right now, I don't know what channel it will end up on. ASN (American Sports Network), a sports network that Sinclair Broadcast Group started with a few games on WUXP 30, has now become a full-fledged, 24/7 diginet channel. It will start this Monday on WNAB 58-2, replacing ZUUS Country. Click here for the article. If there is any more news, I will post it here. This is probably one of the most confusing tv group mergers I have ever seen. This merger is between three groups - Media General (WKRN owner), Meredith Corp. (WSMV owner), and Nexstar. It is about where both Nexstar and Meredith want to each merge with Media General. If Media General merges with Meredith, the new company would have to sell off either WKRN or WSMV per FCC Ownership Rules. Now, according to this article, it now seems that Nexstar is closer to closing on a deal with Media General. I have linked the article above so that you can read it for yourself. If I have any more news on this, I will post it here. Since Media General is participating in the FCC auction, we could loose MeTV if physical channel 27 is sold for cell phone usage! I hope I'm wrong! I'm hoping you're wrong as well. Yep, you heard me right. Thanks to hdrick103, he got an e-mail from the program director at WKRN saying, "WKRN METV will begin airing on 2.2 on 2/1/2016!" I don't know what this means for the Nashville WX channel, but if MeTV does come to 2.2, I wouldn't be missing the WX channel, but of course, since the ABC feed is 720p, they could possibly put the WX channel on 2.4, but it could mean bit starving 2.1. That is all I have for right now. Thanks for the good news. Being able to watch BOTH MeTV and Antenna TV with a strong signal is fantastic! This is great! I get a solid signal on 2.2 and MeTV has an awesome lineup. Watching Justice Network on 2.3, I've noticed the station ID's itself as 2.2 with the ID bug in the lower right corner of the screen. Perhaps it's moving to 2.2 when MeTV comes to 2.3. Just wondering. I don't watch the Justice network, but I will try and see for myself. I have very mixed feelings about MeTV coming to channel 2. I am very excited that we will have a much stronger signal for MeTV. However I don't like losing the channel 2 weather channel, if that's what it means (it is a very quick way to see what has, is and will be happening). And I'm also somewhat concerned about what will happen if Media General (channel 2 owner) merges with Meredith Corp (channel 4 owner). I'm so glad that MeTV is finally coming to WKRN. I've enjoyed Antenna TV so much since it started Jan. 1. And, MeTV programming is similar to Antenna TV. I do hope that they continue to broadcast the weather channel, too. I check the weather channel just about every day. I'd much rather have the weather channel than Justice TV. Antenna TV is now on WZTV 17.3, but I can't get it on my tv. I just came upon it on my HDHomerun device. I can now watch it on either WRTN 6.3 or WZTV 17.3 as I type this post. So, I am wondering if anyone can pick it up on WZTV 17.3 right now on any thing else. I going to try my tv again. I will update this post later when I have some more news. Updated 4:50pm: They have now just took it off of WZTV 17.3. It is no longer there. Updated 5:04pm: It's back again. They have now just added it back on WZTV 17.3. Right now, I'm going to stop updating this post, because I'm getting tired of this yo-yo on-again off-again. Just let me know if any of you can receive it. Bye for now. Can't get anything regarding Antenna TV on channel 17 (physical channel 15). It's on here in the Fairview area as of this moment! Well, that was fast! Just one day after the news broke, Justice is already on the air in Nashville on WKRN 2.3. Now if only they would have been that quick with MeTV, but I know that they couldn't be that fast because it was already on WJDE 31. I am still hoping that they are still going to go after MeTV to put it on 2.2. That is all I have for you right now. I'm very disappointed that MeTV isn't on WKRN 2.3. MeTV has some of the best TV shows of the 60s and 70s - MASH, Mary Tyler Moore, Carol Burnett, Andy Griffith, The Odd Couple, etc. I have zero interest in Justice TV. The Living Well network at least had some decent home decorating shows. Hope MeTV ends up on 2.2. Yes, you heard it right folks. MeTV is now not coming. Instead, the Justice Network is soon coming to WKRN 2.3. I don't know when though. I don't know about anybody else, but in my opinion, that network doesn't have any entertainment value for me whatsoever. I was looking forward for MeTV coming, but I guess now that won't happen. That is all I have for you right now. As of 11:10am this morning, WKRN 2.3 is airing the Justice Network. However, guide data is not present. Buzzr TV is Now on the Air in Nashville!!! I just saw that Buzzr is now on the air on WKUW-LD channel 40.1! Now, I would like WKRN to start MeTV on 2.3. Until more news breaks, that's all for now. How low powered is this station? I am in Donelson and scanned 3 or 4 times and adjusted the antenna and still cannot get it. It is at 15kw (15,000 watts). That is the most a low power UHF station can broadcast. I'm about 50-60 miles away from Nashville, and I can just barely get it. At times, it is coming in clear, while other times, it's glitchy. I live a mile from Opry Mills and have no problem receiving the station. I live in the Fairview area and can pick it up well most of the time. I live in Carthage and get it about 85% of the time. And now the 40.2 pointless shopping channel also. I live just south of Franklin and receive a good signal. The station does NOT offer program data which makes it almost unusable for viewing and recording. And 40.2.. gee, another shopping channel! Dr.TV is about as bad. I live north of Mount Juliet at Old Hickory Lake. I can't give a percentage but I have nice clear signal. Thanks everyone. It might just be me. I am on Graylynn Drive near McGavock Elementary School. So I sit in a hollow kind of with big trees all around. Thanks for the information. I will keep working on it. I'm getting a clear signal (most of the time) for this station near Vol State in Gallatin and also in Hendersonville near Blue Grass Golf Course. "Thanks for your interest in our channel. Buzzr will be on 40.1. It should be on before the end of the month." I, myself, am looking forward to Buzzr! That is all I have for you right now. Also, I just recently heard that Antenna TV may be moving onto its new channel (WZTV 17.3) as soon as Dec. 3rd. I will try and see if this is true. That is all I have for now. If any other news breaks (digital tv news wise), I will post it here. Updated 4:35pm: I just heard from the people of DTV America (owners of WKUW-LD channel 40). They said, in the e-mail posted below, that they have plans to add Buzzr, a shopping channel, and female oriented channel like Lifetime. My guess is the last one will probably be the Escape network. There are plans for more. You can read the e-mail below. "Thanks for noticing our channel is up and running. We are actually planning out several sub-channels right now. While I can’t say for sure how many we will eventually add, we are already planning to add Buzzr TV (old game shows we grew up on), a shopping channel and a female oriented channel (Similar to Lifetime). We are talking to others including a 24/7 news channel. Please keep watching and spread the word about FREE Over the air TV. Happy Thanksgiving. " I'm looking forward to Buzzr. Now if only channel 2 would add Me TV and let H&I return to channel 31. Yes, I am too looking forward to Buzzr. When I scanned for new channels, I did not pick up channel 40. Do you know what direction their tower is located? I am in Donelson. Yes, I do know. They are on the same tower as WNPX 28 and WPGD 50, which is in northern Davidson County near the intersection of I-24 and Old Hickory Blvd. By the way, they are now showing Buzzr TV on 40.1. I'm sorry, jdax1701. They are currently broadcasting at 15kw. 15kw is the maximum a low power UHF tv station can broadcast. Antenna TV is Moving to WZTV!!! Yes folks, after a while of being on WRTN 6.3, Tribune broadcasting (Antenna TV owner) has signed a deal with Sinclair Broadcast Group to move Antenna TV from WRTN 6.3 to WZTV 17.3. As far as I know, it will be on 17.3, unless they replace WeatherNation with Antenna TV on 17.2. A link to the article is here. I don't know what this will mean for WRTN 6.3. I guess that will just open a door for another network, hopefully Heroes & Icons since it is not currently on WJDE 31. That is it for right now. I will post again when things change. The Antenna TV site shows channel 17.3 & will start on 1/1/16. No, tjgeenen, there is no 17.3 just yet. It will probably be closer to New Years Eve when they will turn 17.3 on. First off, I'm sorry, but I meant to say something earlier about this. A new low power channel is coming to Nashville. It will be on channel 18 in north Nashville broadcasting at 15kw. Don't get too excited though, it is owned by the religious network, TCT, and it will probably only broadcast what they have on WJFB 44. I will post again when they bring it on the air. What will happen to the Lebanon facility? The previous channel 44? Channel 44 will still be there. It will be the full power station while channel 18 will be the low power station. Actually, channel 18 is the digital channel of the now defunct analog channel 11 that was broadcasting on Spring St. in Lebanon. I have spent a lot of time bringing WJFB facility up to our specifications, the signal should be much improved. When 18 comes out of the commission, it will be built to repeat the full power 44, to fill in any gaps. TVengnr, thank you for visiting the site and keeping us up to date with channel 18. Please keep us informed every step of the way. Certainly, Recently with WJFB we increased power, replaced the exciter, and intermediate power amps, new output filter and optimized the entire rf system. All to make the best signal, also, put in a full hd master control. The off-air signal should be better than it ever has been. Would love to get some viewer reports on performance. I know on our end it is 1000 times better. As soon as we have our CP for 18 from the FCC, it will be built out quickly, It will be located on the towers north of town with most of the other broadcasters which will help with antenna pointing. Well, Comet is now on the air. The only thing, from what I have heard, is that it is on 21.5. Channel 21 is the actual rf channel of WUXP channel 30. If you don't automatically see it, then probably all you have to do is just to do a rescan. Only certain tuners and TVs can receive that channel at this time. By Saturday, every tuner should be able to see the channel, because that is the actual launch date of the network. I forgot to post this earlier, but thanks to w9wi for reminding me, that the Media General/Meredith merger is still up in the air. It is not dead like I reported earlier. I'll try and keep up with it as news breaks. About the new website, I am still working on it. It's taking a lot longer than I thought. That is all I have for right now. I receive it on 30.3. One of my tv's received it but lost it when I changed channels (info said hidden channel). I hope it is back tomorrow. I still have one tv receiving it on 30.3. Also it comes in on my dish converter box but I get sound only. Why I don't know. It changed to a test pattern around 1 am. Within the past couple of hours it is back to broadcasting that it is virtual 30.3, and is now an infomercial. WUXP 30.3 is Now Live! Yes, 30.3 is now on the air, BUT all they are showing right now is a copy of GetTV. They are just getting the channel ready for this Saturday morning when Comet TV will launch. That is all I have right now. About noon I put a request in to Schedules Direct/Zap2It to add 30.3 with Comet programming to their listings (I'm guessing WUXP 30 is on the ball, but good to make sure that doesn't fall through the cracks). It should be listed soon. I'm looking forward to Comet TV. It will be a welcome addition to Nashville TV. Now if only Me TV would move to channel 2 and H&I return to channel 31. I'm getting Comet TV.on 21-5. When it was broadcasting a duplicated of 30.2, it was showing up as 30.3. It seems when they actually started actually broadcasting (pre-official launch of) Comet TV, it lost broadcasting a virtual number. So it is coming in on their actual frequency/subchannel number. Hopefully they'll get it straightened out soon. Just thought I would give you a heads up. WKUW-LD channel 40 in Nashville will be doing more test patterns next week. I don't know when exactly, but I will post when they are doing that. I thought you might want to try and see if you can receive that channel. That is all for right now until later. Thanks for the heads up. Would like to see if I can get it. I know the RF vs virtual channel numbers are very confusing. E.g. Nashville RF 10 is virtual 4.1 through 4.3; RF 27 is virtual 2.1 through 2.3; RF 7 is virtual 6.1 through 6.7; (even more confusing) both RF 25 and RF 5 are 5.1 through 5.3; etc. Yes, it is. The actual broadcasting rf channel is 40. So far, they haven't started testing yet. When they will, I will post about it. WTVF if a special example all around it seems. lol I was out of OTA TV before just a couple of years ago so I don't have full history, which seems they have taken a long path. My comment wasn't meant to indicate we shouldn't have virtual channels, but it does get confusing as 99% of the population probably don't know about them, or know that entering 10 into their TV will likely pick up changes on virtual channel 4 for instance. The schedule for the first week has been posted on their website. You can find it just above the contact information at the bottom. Right next to it, they have a one minute video of what will be on in November. Just click here to go to the website. That is all I have for you right now. 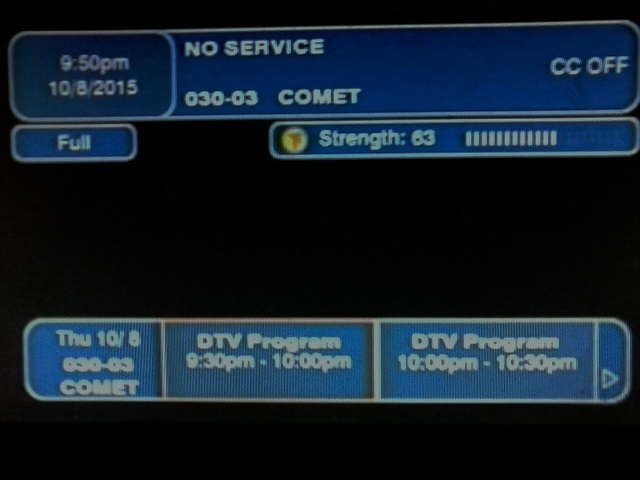 I don't know why, but on one converter box, it picked up 30.3 saying "Comet" while other boxes and the TV cannot pick it up. It is not showing any video though. That may be the reason it is not picking up. Until something else comes along, that's it for now. Updated: 10:55pm - I just thought if you couldn't get it that you would want to see the channel. I used the DishTV Pal Converter Box. Well, the merger of Media General (WKRN Owner) and Meredith Corp. (WSMV Owner) is NOT going to happen after all, but there is an offer from Nexstar Broadcasting Group to acquire Media General. What this will mean for MeTV coming to 2.3? Who knows, because of the history with Nexstar and any subchannels is not good. With their stations, they usually do not deal with diginets. So, I don't know what is going to happen with WKRN. In other news, to the people that live and work in and around Murfreesboro, WETV channel 11 is coming back in digital form. Yes, WETV analog channel 11 had been off the air for some time, but they (WGNS Radio) is bringing it back as a digital channel. The reason I am saying this is just for people in and around Murfreesboro is because it will only be broadcasting just 10 watts of power, which is not that much at all. Here is a link to the RabbitEars website that shows who might or might not get it. If it is going to be the same thing as the analog channel, then all that is going to be on it will be the audio of WGNS radio with advertisement slides. That is all I have for you right now. Until next time. The merger isn't off; Meredith & Media General still expect to close the deal. http://meredith.mediaroom.com/index.php?s=2311&item=136946 It's conceivable Nexstar could derail the deal but it certainly isn't derailed right now. I just found out that through their website (comettv.com) that they will be launching October 31st at 9am CT. Here in Nashville, they will be coming on WZTV 17.3. On there, they don't have a schedule up right now, but they do advertise a few things and what times they will come on. That is all I have for now. Great news. I'm glad we are getting something new. Looking forward to it. I'm looking forward to this channel! The website indicates alot of programming of interest for me. Thanks for the info, NashDigie! I just thought you all would like to see the lineup as it is right now. Either for the ones who couldn't see because it wouldn't stay on the screen for but a second or the ones who can't even receive the signal at all. If there are any more changes, I will post it. No, I haven't heard anything new on that matter, but first, he has to file an application with the FCC in order for them to permit him to raise it. Once he does, I will let you know. It might take the FCC up to a month or two to grant the application. Once it is granted, then he can raise the power on channel 6. I have reason to believe that Comet TV, supposedly the new sci-fi network from Sinclair Broadcast Group, is coming soon to WZTV 17.3. I have no idea what the schedule is nor about what time it is going to launch. I see that it has been added to the Rabbitears.info website. I might also have found the website. If it is the website, all they have is a bluish looking background with possibly the logo of the network, but again, I don't know if it is their website or not. It is at comettv.com. That is all the information I have at this time. I just found out that ThisTV is now on WRTN 6.6. I guess this is temporary, because it is on x.6 instead of x.2, like the new lineup. If any more news breaks, I will post it. This is great news. There are 3 (sometimes 4) solid entertainment channels on 6.X. Now ME-TV on 2.3......and maybe BUZZR down the road. Things are looking up! Thanks for the information! What he meant by "YOU Choose" is that he wants to hear from us, the viewers, as to what we want on channel 6.6. He provided a list of options as well. The list is either Classic Movies, Rev'n, or Tuff TV. To me personally, I would say neither. I would say Buzzr. BTW, his e-mail address is rick@wrtn.us. I don't know what happened to "The Works". That is all for now. It would be nice if they could boost the signal. I'm unable to pick up the 6 channels just west of Nashville. I have an antennae that reaches up to 50 miles also. I wouldn't mind having Buzzr too. I would love to see those old game shows, like GSN showed about 15 years ago. I don't know if he can get it, but can't hurt to ask for it. Tuff and REV'N are just a waste of channel space, IMO. If those are the only options, I would rather he leave 6.6 as is. mikesbizz01, I had problems with the 6 channels too. I had to add a signal booster. Sometimes it does okay without it, but I usually have to use it to pick them up. Personally, it doesn't matter since I can't pick up a signal with a boosted antenna here in DONELSON. I would be watching Antenna TV if I could get a signal. I was begging Antenna TV to come here 2 years ago. But something that shows freak tv shows from the 60's, 70's, 80's and 90's would be fantastic. I live in the Mount Juliet area and I point my antenna between downtown Nashville and Madison and I get almost every channel. You should be able to do the same thing from Donelson. I have an Antennacraft HBU55 with a signal booster. Split to three TVs. Good luck! Laff TV Coming This Sunday Night! I found out that they will switch from ThisTV over to Laff at 11pm this Sunday night. So, if you will be up at that time, you can see them switch it over. I don't know if they will take ThisTV off before 11pm and then at exactly 11pm put Laff on or wait until 11pm then take ThisTV off. I don't know what they will be planning on doing, but I will watch it myself and see what happens. Also, I don't know when ThisTV will be placed on WRTN channel 6 or where on channel 6, but when it does, I will let you know. That's all for now. Awesome! I know some people aren't excited about it. But it is on a strong high power signal that most people can reach, unlike MeTV and Antenna TV. I am tired of the same bs on television so I enjoy watching many of the old shows from the 80's or 90's. I watched as ThisTV changed over to Laff TV. It was completely seamless. One minute a movie ended on ThisTV. The next minute, the Laff TV show started. I only wish channel 2 had been this efficient in changing over to MeTV. I miss the Living Well network and I'm tired of the long wait for MeTV. I agree with you wholeheartedly on waiting for MeTV, but I have to say I disagree with you about LiveWell. I do have to say that with the merger of the two owners (WKRN & WSMV) though, that MeTV may not even come now. Well, until something else comes along, that's all for now. Antenna TV is on the Air on WRTN 6.3! Yeah, I just saw the "Patridge Family" on 6.3. Antenna TV is finally on WRTN!!! Until more changes occur, I think that is all for now. It would be nice if the stations communicated these changes with Schedules Direct / Zap2It in advance. I now have recordings of Partridge Family and Small Wonder instead of Dr Who. Far as I know, there is nothing new with MeTV. I would have to say that the merger probably pushed it back or even has snubbed the deal altogether. I just don't know at this point of time. Big News! WKRN and WSMV Owners are Merging! Yes, you heard me right. WKRN owner, Media General, and WSMV owner, Meredith Corp., are merging, but via this story, for fcc regulatory reasons, they will either have to swap or sale WKRN or WSMV. What does this mean for either the network affiliatons, people jobs, and/or the deal for MeTV on WKRN? We will just have to wait and see. First, I would like to say that I am sorry for not posting sooner than this. Second, I don't know what is going on with WRTN, but on Antenna TV's website, they have now pulled Nashville off of their affiliate map even though the owner of WRTN is still running ads saying "don't give up, it's coming soon". So, I don't know what exactly is going on. As far as I know, it could be (and this is my theory) that Antenna TV listed it as 6.1, but he is actually going with either 6.2 or 6.3 or something else, and they had to take it off to change the channel. I don't know. It could might mean that some other Nashville station is striking a deal with Antenna TV. I guess we will only have to wait and see, like with all the other networks coming soon. Also, in the next few weeks or month, I will completely be overhauling the website. Of course, you won't be seeing any difference until I actually take the new site live. Don't worry about your password or comments, they will not be affected. I will still be posting on the website (when news happens) while I will be doing this. So, that is all for now. See ya. I'm sorry I didn't post this sooner, but I e-mailed and found out why Laff did not launch this past Saturday. In the e-mail, he said that they had some contractual issues, and because of that, they will now launch Laff TV on September 21st. So, I am guessing that the owner of WRTN will not do anything until he can put ThisTV on his channel so that he can do all the channel shuffling in one fell swoop. I have heard something of MeTV coming to WKRN, but I have no idea how solid the information is. What I have heard is that it will be coming in the fall, but would it be something if MeTV, Laff, Antenna TV, and The Works would all start broadcasting in Nashville on the same day. Thanks for the update. It will be great to see these plans come together. I'm sure there are a lot of hoops to jump through. For an official reference, the MeTV website lists it as coming to 2.3 (date TBD) as it has for a while now. MeTV Nashville Affiliate page However, as mentioned in more recent news, the merger between the owners of WKRN and WSMV may change this plan. Thanks for helping keep us informed on upcoming TV events! What I mean by the title is that in the next coming days, possibly WRTN channel 6 and definitely WTVF channel 5 will be changing networks. I know that WTVF channel 5 will switch ThisTV out with the Laff network either Friday or Saturday. When they added NC5+ and ThisTV a few years back, I noticed when they did it, and it was on July 31st during the 5pm newscast. So, if they do Laff that way, then it might be Friday when they put Laff on 5.3. I say "possibly" with WRTN, because I can't tell when he will add ThisTV, The Works, or Antenna TV. He first has to wait on WTVF to give up ThisTV, so it can be available for him to put it on his channel. That is all for now until more news breaks. Thanks to tomintn, I have found out that the Antenna TV website has listed the network coming soon to channel 6.1. Since this is where Antenna TV is going, I wonder then where This TV will go. It was announced a month or two back that This TV would be coming to 6.1 August 1st. Now I just wonder if Antenna TV will be changing channels or will it stay on 6.1. I don't know when it will start on 6.1, but as soon as I find out, I will post it here. It may be replacing Daystar when channel 20 comes back on the air. It's possible Rick had to agree to put Antenna TV on 6.1 to get it. I'm just looking forward to getting it finally. I hope Rick is still going to have This TV! NashDigie, in your archives, there is an entry that This TV will go to 6.3 (from 5.3). Remember the ".3" entry? If that is the case, Antenna will go to 6.1 as stated recently on the Antenna TV website. Yes, tomintn, I do remember that. If that is so, then when Antenna TV, This TV, and The Works all come on the air on WRTN, I wonder which other channel will be thrown out other than Rev'n unless he actually adds a 6.8. All this is interesting to me, and I will love to see when this all unfolds. I just found out that Sinclair (the owner of WZTV Fox17 and WUXP MyTV 30, and operator of WNAB CW58) has made an agreement with MGM to start up a science fiction digital network. It will be drawing programming from the MGM library of science fiction shows and movies. At this time, I have no idea what channel it will pop up on. It will be debuting sometime this fall. I am posting a link to the article below. This sounds great, but it makes me wonder about the competition this creates (locally) for This TV, which is moving to WRTN in August (when it moves from WTVF). I enjoy Stargate SG-1 & The Outer Limits on This TV. As my luck runs, the new SciFi channel will start, This TV will remove all scifi programming, but the SciFi channel will not have those programs. Hopefully, both will survive! I found out earlier today that WJNK-LP analog channel 34 is back on the air. I personally thought that they had turned off analog 34 for good and would start broadcasting in digital on channel 28, but I guess all it was, was an equipment failure. That is all the news I have for you right now. Analog channel 34 has been off the air since this morning. It is a 3ABN owned and affiliated low powered analog station. It currently has a construction permit to have a low power digital channel 28. I don't know if they have had an equipment failure with analog 34, or if they have cut off the analog channel for good and will bring digital 28 on the air shortly. If anything else changes, I will post it here. WJNK-LP 34 is back on the air today. It is still analog so I guess they had equipment failure. Yeah, I happened to see it earlier. I was about to post about it. Finally, LiveWell network is no longer on WKRN 2.3, but there is still no MeTV. They have, for right now, duplicated the Nashville WX channel on 2.3. There is yet still no date for when they will start MeTV on 2.3. When I say that, I am referring to the Nashville affiliate page on the MeTV network website. Until more news breaks, that is all for right now. Thank you for your information and ongoing updates! We are (not so) patiently waiting for ME-TV to arrive on channel 2.3. Hopefully we will not have to wait much longer. Well, thank you so much for that. I appreciate it. I have MeTv on 31.1. Live Well was a good option for cooking and home improvement shows. Because of the really low power channel 31, I am unable to receive that channel. So, I am really looking forward for MeTV to switch to 2.3. Thank you Keith for that. Yes, there is an e-mail address at WKRN. The e-mail address is programming@wkrn.com. I, myself, am really looking forward for MeTV coming to a full power station here in Nashville. I was changing the channels, and I just happened to came upon channel 4.3. Now, I just wonder when MeTV will start on WKRN 2.3. Cozi looks better there than it did on 6.3. I'll be glad when Me TV moves to 2.3 also. H&I hopefully will return to 31 then. It looks like channel 31 may be putting Soul of the South back on 31.2 where H&I was. Live Well is replaced with WKRN's weather channel for now. Hopefully Me TV is coming next. There are two news stories about WRTN. #1 He is going to raise the power from 300 watts up to 3,000 watts, and #2 he has finalized a deal to carry Antenna TV. Both of these will not take into effect until later this summer, but when they do, I will have to say the station will probably be getting more viewership both by more people receiving the station and people watching Antenna TV. Until more news comes along, that is all I have for you right now. I have recently found out that Cozi is going to start broadcasting on 4.3 beginning June 1st. I am glad that they have finally have a starting date. Now, we just hope that WKRN will soon dump LiveWell and start broadcasting MeTV. I will try and find out. Yes, you read it right. The long time family-owned tv station is now being sold, but for all you hoping for some good diginets to start airing on WJFB, I'm sorry, because WJFB is being sold to the TCT Network. They have their own networks like: TCT, TCT Family, and TCT Kids. Now, they do have like one or two old shows on their networks like: Bonanza and The Lucy Show, but that is about it. The majority of their programming is religious. That is all the news I have for you right now. Thank you for reading. I hope WKRN will stop stalling on this. Last week I heard from them and they said they still had no set date to drop Live Well. I hope they will give you more info. It seems like they should have some idea by now of when they will take Live Well off. Well, they just gave me the same story that they had no start date for MeTV. LiveWell is dead across pretty much the whole country. I just don't see why it can't be dead here as well. I just found out "officially" that Laff is coming to WTVF (NewsChannel5). Why I put quotations around officially is because I pretty much knew that WTVF would probably get Laff since it is owned by the same company (Scripps) that helped launched Laff in the first place. Also, I said officially because Scripps has released a press release confirming that Laff will come to WTVF. Now, I just don't know how it will go down. What I mean is that I know that ThisTV will stay on 5.3 until Aug. 1st when it will go to WRTN 6.1. I don't know if they will put Laff on 5.4 until ThisTV goes away or just wait until Aug. 1st when ThisTV will leave 5.3 vacant for Laff to occupy. I don't know what their plans are. That is what I thought WKRN should have done in the first place, and that is to place MeTV on 2.4 leaving LiveWell on 2.3, since they decided to keep LiveWell. I am adding a link to the press release below. That is all I have for you right now until next time. WJFB 44 has been off the air the past few days. I e-mailed them yesterday and got a reply back from them today. I also asked if the programming will change. What they said is below. We will be back on air. We are installing some equipment. It will stay TCT programming. I'm sorry for not letting people know sooner, but WJFB is already back on the air. I think they went back on the air (with no change) sometime yesterday afternoon. I got a response back from WJDE, and I am posting below. If there is any more news, I will post it here as soon as possible. Yes decades should be still on the air along with movies and MeTV. Heroes and icons however has a contract issue and we cannot clear them right now. We do hope to have the signal improved in the coming year. Thanks so much. I wonder if Heros & Icons was to replace Me TV and they don't have permission to cary both at the same time? I miss some of the programs and will ge glad when it returns. Improve signal? Same song, second verse. Thanks to Brentwood OTA and lug1, I have heard that Decades is back on the air on 31.3. There is still no H&I on 31.2 yet, but I am going to try and reach them and see what is going on at WJDE and also see what WJDE's future looks like. If I get any information, I will post it here. First, I would like to apologize for not updating as things change. Anyways, here is what has happened in the past week. It seems to appear that 31.2 Heroes & Icons had gone to just showing a test pattern, and then, this morning, 31.3 Decades is now just showing a test pattern as well. I don't know if this means anything or not, but Decades still has not officially launched yet. Heroes & Icons has already launched. I am going to try and find out what is happening with that channel (WJDE). I will get back with that once I have news. Awhile back, I posted that WNPX-LP low-power analog channel 20 had been sold to Word of God Fellowship from the ION Media Group. For a while there, it kept showing ION until yesterday. It was around 1pm that channel 20 was shut down. I don't know if they finally shut the analog channel off to change over to digital, or there was a problem with the broadcasting equipment. I just don't know at this point of time. Also, I found out that Word of God Fellowship actually owns Daystar. So, I wonder if they will take Daystar away from WRTN or not. If they do, that means it will open another channel up for another network to air there. Updated: I just found out through a source that they are indeed changing channel 20 over to digital operations, and when they get it on the air, they will be airing Daystar. So far, there has been no changes with the new channel lineup. That means no Cozi TV on WSMV 4.3 and no MeTV on WKRN 2.3. The only change has been on WRTN where the owner replaced Cozi TV with RetroTV that was on 6.2. Then, he replaced RetroTV on 6.2 with Rev'n. Since then, he has received negative feedback about Rev'n. It was said that people were favoring PBJ for a replacement. There has been no other changes done. Decades is back on 31.3. Still no idea what is going on at 31.2. The station is operated out of Louisville, KY, and it is hard to reach anyone to talk with about Nashville. Decades came back on this morning but with no sound. The sound came back this afternoon. I don't have any idea about H&I either but miss it. I enjoyed Broken Arrow. Thank you both for the update. Brentwood OTA, I am going to try myself to get a hold of them. If I get any information, I will post it on the website. I just saw that Cozi TV is not on WRTN 6.3. They have now put RetroTV on 6.3 and placed the PBJ network (Rev'n network) on 6.2. So, maybe this is the start of Cozi moving to WSMV 4.3. I'll bring you more updates when they come available. Now PBJ is gone & REV'N is there. I wish he would have put something better on, like Antenna tv. Rick said he will reshuffle things again in Aug. Also, he said he has tried for Antenna tv & hasn't been able to make a deal with them. I'll be glad when Cozi goes to 4.3. I miss both it and 31.2 which seems to be broadcasting a test pattern. REV'N is the only channel i've seen other than shopping channels that is worse than than the Live Well network. Well, I just got news that WJDE (low-powered channel 31) has changed their lineup again. I thought maybe they were taking MeTV off so that WKRN would pick it up on 2.3, but they still have MeTV on their channel lineup. Their lineup is has below. That is all I have for right now. There is new information regarding WRTN's future programming. I just heard that ThisTV and The Works will be added August 1st. I guess the reason for not adding ThisTV before August 1st is because WTVF (NewsChannel5) has a contract with ThisTV that expires July 31st. About The Works, I don't know much about it, but I am providing a link to their Wikipedia page below. He also said that he was "tweaking" the signal this afternoon. He wasn't increasing the power, but he was just going to work with what he has. That is all I have for you right now. 5.3 (This TV) is also on Comcast cable here so I expected it to stay until their contract expired. They will lose a lot of available viewers when This TV goes to channel 6. I'm looking forward to all the changes coming here but I still wish for Antenna TV. About all the changes, yes, I am also looking forward to it. I just wish they would all hurry up about it. Also, about Antenna TV, I, too, want it to come to a full power station instead of channel 6 or 31. Since WKRN 2 is taking MeTV away from low power WJDE 31, I am hoping that some of the full power stations would also take both Decades and Heroes & Icons away from them as well. I also wish Decades, etc, were on better stations. I don't understand why a network would deal with such weak stations. They're not doing themselves any favor. I don't know why WJFB doesn't try for better programming. Maybe we will get Antenna TV sometime...I hope. By the way, someone at Channel 5 says they think Live Well "disappears" next week. We'll see, can't be soon enough for me. The *.3 Switcheroo is Coming! Be Prepared! "Yes, looks like Cozi is going to WSMV and we are going with ThisTV. With the FCC trying to take away more UHF TV channels, I decided it was best to stay on 7." First, I did not expect that ThisTV would be going anywhere. Second, this is what I meant by ".3 Switcheroo". First, Cozi TV moves from WRTN 6.3 to WSMV 4.3, then ThisTV moves from WTVF 5.3 to 6.3. I am guessing that means, just speculating here, because WTVF is owned by Scripps that that will open the door for Laff network to air on 5.3. Exactly when all this will happen, I have no answer for that yet. That is all I have for you right now. If you would like to comment, please do so. I would like to hear what your thoughts are on this. Thanks for the info NashDigie! I'm glad This TV is staying in Nashville on 6.3. I get the 6.x channels very well, and I love Stargate SG-1 & The Outer Limits! (I never watched SG-1 when it was on SciFi Channel, now called SyFy Channel.) The moves for MeTV and CoziTV are great! I still would like to be able to get Heros & Icons and Decades, but I don't expect WJDE will ever apply to increase transmitter power. All of this sounds good to me. I only wish 6.3 had went to Antenna TV instead of This TV. I haven't watched anything on This TV in a couple of years. I really like Heros & Icons and will be glad when it's back on WJDE. Also I think a move of antenna to Whites Creek would help them more than a power increase. I get 31 and 42 at the same signal strength even though 42 has 3 times the power. Cozi TV is now going to be airing on WSMV 4.3. By the article in the link below, they said the network will launch this spring. What is odd about this is that Cozi is already broadcasting in the Nashville area on WRTN 6.3. So, what does this mean about 6.3. Will they both air the network or will 6.3 be something else like perhaps maybe a new network? I don't know, but I am going to try and find out. When more news comes along, I will post it here. That's great news for those who live too far to pick it up now. Interested to see if anything will change with 6.3. Thanks to dbone55, there has been another change at WJDE 31. Where Heroes & Icons was, now there is the Movies! network. When WJDE was adding the new networks, they, at one time, had "movies" as the PSIP of the channel where MeTV is. So, I assume that Movies was going to replace MeTV when it went to WKRN. That is just my speculation. Does this mean Heroes & Icons is done or just temporarily displaced? I don't know, but when something else happens, I will post it here. Movies replaced Hero's and Icons a week ago (last Monday).It is still listed as H & I on the TV. Movies originaly was listed where Me TV is. I personaly think that it will replace Me TV but until it does H&I and Movies will take turns on 31.2. I hope Channel 2 hurries up and puts Me TV on. New information. Now, it could be April 15th before MeTV ever comes on the air on WKRN 2.3. They said they are still working out the details with the MeTV officials, but they say the change over could be done at some point. So, hopefully, they can work it out soon. That is all I have for you right now. This past Saturday, I went into the Nashville area and while there, I had a portable digital tv and antenna with me, and I looked at WJDE 31.1-31.6. MeTV was indeed broadcasting on 31.1 and Heroes & Icons on 31.2. Decades has started on 31.3, but it had no sound. I turned the volume up and I didn't hear anything at all. HSN was on 31.4, and the other two channels, 31.5 and 31.6, were religious. I didn't pay that much attention to those channels. I was more interested in looking at H&I and Decades. That is all I have right now. Decades lost sound on Jan. 16 just before it started showing "The Millionare". I checked last night and it has sound again (showing "The Doris Day Show" this weekend). I don't know when the sound returned as I have been away. 31.6 is still Soul Of The South although it may have had a religious program on at that time. Thanks for the comment. I think it was sometime last week, that I got an e-mail from someone that they had put the sound back on. I actually was able to see 31 again yesterday, and got to see for myself. I am still hoping they would not only power up more, but also move it to the north where most of the channels broadcast. I agree. I think moving their transmitter to Whites Creek would help more than a power increase. Channel 42 broadcasts with 15,000 watts from the same tower and it's signal strength here in Gallatin is no better than 31 is. There is yet another new network coming this summer to the airwaves. Joining the already crowded airwaves with Heroes & Icons, Decades, and Laff, FremantleMedia is teaming up with Fox owned & operated stations to bring forth a new network called Buzzr TV. The network will be showing some classic game shows from FremantleMedia's library of game shows. There is no word yet on any affiliation with any Nashville tv stations. I don't know if this means anything or not, but on Titantv.com, WKRN 2.3's schedule goes to "Off Air" starting on Jan. 28th at 4am. Now if that is when MeTV takes over, I don't know, but that does give us hope. There is yet another new network coming to the airwaves. It is being called LAFF (laugh). It is being made by Katz Broadcasting and being affiliated with ABC Owned and Operated stations and E. W. Scripps Group of stations. Their is right now no affiliate in Nashville, but since it is being showcased on Scripps owned stations, it could be coming to WTVF channel 5. It will have a compilation of comedies whether it's tv shows or movies. The links below are for the article and their actual website. I just found out that WJDE has a new channel lineup. I just hope that they won't have MeTV for long that WKRN will start broadcasting it. That is all I have for right now. They seem to be constantly moving the channels around. I will be glad when Me TV goes to 2.3 and the channel changing is over, although I'm afraid it won't for a while. I just got an e-mail a little bit ago. It is not good news for people, like me, who wants to see MeTV on WKRN 2.3. The e-mail is below. "There is no specific date yet set for MeTV to be launch on WKRN D2 channel. We are working on the process, but it may take a few weeks or months to resolve. Sorry." So, I guess that means we will have to wait longer for it. I want to thank BrentwoodOTA1 for the information he gave me in his comment on an earlier post. Also, I have looked ahead at the 2.3 schedule on Titantv.com website and found they have continued on with the LiveWell programming. There were some MeTV programs listed for Thursday, and now, they are no longer there. That is all for now. I wonder what they have to resolve. It seems like they were going to make the change until the decision was made to keep Live Well on, showing repeats. I hate the way this is being dragged out. I'm really hoping that this doesn't affect us at all, but LiveWell is going to stay alive for a few more months. WBAY (a LiveWell affiliate in Green Bay, WI) is not switching to the Decades network and staying with LiveWell. I don't know what this means about WKRN 2.3 switching to MeTV, but I will try and find out. By the way, the link to that story is below. I got an email from the WKRN program director. She said it may be a few weeks to a few months before Me TV comes to 2.3. Not what I wanted to hear. Launch of ME on 2.3 is planned for Friday, Jan. 16. Two questions as food for thought: With ME on 2.3, is the addition of H&I and Decades over on 32 meant to replace ME on the WJDE channels at some point? With channels now from pioneering newcomers (Luken, Weigel), regional superstations (Tribune with This! ), and studios (Sony with getTV), how much longer before the major cable players start up digital networks? First, thank you for your post. Just out of curiosity, where did you get your information about the launch date of MeTV? Second, as for your WJDE question, I know that 32.1 is where they have MeTV right now. It has "Movies" as the call letters on that channel. I don't know for sure if that is the network that is taking that channel or not, but "H&I" (Heroes & Icons) on 32.2 and "Decades" on 32.3 are networks that they just added on. As for your other question, yes, I would like to see that happen, but I just don't see that happening anytime soon. Was told by a WKRN employee that they were now going to stick with LiveWell until it "played out". I was the one who took this to be Jan. 16 since I knew LiveWell was ending on the 15th. However I have since learned that ABC O&O stations decided in the past few days to let the channel go into reruns instead of killing it altogether just yet. Production of new programming has definitely ended. My guess is that the O&Os are thinking now about doing something as a group again and buying some stall time or they have someone still willing to spend advertising dollars on it. Given the way decisions are being handled on both the ownership group and local levels, I'd say this could now change at any moment... Or not. I'd also guess WJDE moved ME back to 31.1 once they knew they would have it a while longer rather than replace it at 32.1 with the Movies! network. I want to thank you for the info. Please keep me updated on this. Grit TV is on Right Now! Grit TV has finally come on the air on WNAB 58.3. So, if your tv/converter box doesn't automatically add channels, you will have to do a rescan to add the new channel. Now, we just have to wait on WKRN to replace LiveWell with MeTV which will be at 12am on January 12th. I have seen where they (MeTV's website) have listed WKRN as an affiliate, and Titantv.com is showing MeTV's programming starting at that time as well. People, who have been waiting for Grit TV to start here in the Nashville area, don't have to wait much longer, because Grit TV will begin on January 1st on WNAB 58.2. It will be replacing ZUUS Country. Me-TV is Coming to WKRN this January! Coming January 12, Me-TV is moving from low-power station WJDE 31 to full powered station WKRN. It will most assuredly be replacing LiveWell on 2-3. That is all I have for you right now. WeatherNation has just began broadcasting on WZTV 17.2. GritTV is not on the air as of yet, but when it does, I will let you know. It will probably be on WNAB 58.2. I noticed it on the air yesterday about 7:30PM. I'm looking forward to Grit TV and wish it had gone on the air instead. I just got word back from the WRTN owner and he said, "Should be fixed now." So, I checked the channel and it is indeed fixed. If any more news comes out, I will let you know. Hi, folks. I would like to start the updates with WeatherNation and Grit TV. It looks like WeatherNation will be going on WZTV 17.2 while Grit TV will bump ZUUS Country off of WNAB 58.2. I don't know when they will start broadcasting, but when they do, I will post it here and let you know. Now on to Cozi TV. I don't know if anyone has paid any attention to it or not, but Cozi has been having audio and video sync problems for the last few days. I don't know if the problems exists at the station (WRTN) or if it is the network themselves, but I will e-mail and found out. That is all I have for you right now. In the future, I will try and update as soon as I find out anything. I have had problems with Cozi for the last few days also. I hope they get it corrected soon. I would think it is on WRTN's side. COZI would have corrected it if it was their problem. Also I'm looking forward to Grit TV. I know this is not about Nashville, but I thought this might interest people that is in the western half of Middle TN. Yes, Jackson, TN is getting their own NBC affiliate. It will be coming on a new low power digital channel. It will be broadcasting on channel 16 at 15kw. If anyone can tell me when it does come on the air and if they have any subchannels, that would be great. Thank You. Grit TV (Grittv.com) is coming to Nashville, and it will be coming to WZTV 17.2. If you're someone who likes western, action, and war movies, then you are going to love this channel. Right now, it is not on the air, but when it does comes on the air, I will let you know. Retro TV is Back on the Air Again! After just one day of being off the air, Retro TV is back on WRTN 6-2. I don't know what is going on, but I hope it can stay on the air now. The whole court battle is finally over, and they (Luken Communications, Retro TV Owner) will be coming out of bankruptcy this month (Oct.). I have a link to the story below. It comes from the Chattanooga Times Free Press website. If any else happens, I will let you know. For Retro TV fans, I'm sorry to say Country Clips is back on the air. I don't know why Retro TV is not being shown, because Tuff TV, owned by the same company, is not affected. It is still being shown on 6-5. When anything changes, I will let you know. I just found out that Retro TV (formerly RTV) and TuffTV is back on the air on WRTN. I will look and see if the court case has been settled, but it really don't matter because Retro TV is back now. I will look into it anyways and report back. WUXP MyTV30 is back on at full power. Through sources, I found out that it was around 5:30pm this evening when they put it back up to full power. If there is anything else, I will let you know. Sorry, I haven't posted in the last day or two, but WNPX-LP analog channel 20 is back to normal. I am saying that based upon my reception is back to the way it was. Now, WUXP MyTV30 is back on the air, but only at reduced power. At this time, I don't know when they will go back to full power, but when they do, I will let you know. I was wondering why I was not receiving it on one of my TV's (it is on an indoor antenna)but on all others. Hopefully I will get it again when it gets back to full power. If you haven't realized yet. WUXP MyTV 30 (rf 21) has been off the air since yesterday evening. It has tried to come back on the air but for a few seconds though. I have e-mailed the station and have gotten a response back. I have posted it below. It doesn't really tell me much, but at least they responded back. Sorry for the inconvenience, we are having technical problems with our transmission tower and our Engineers are working on it. If I get any more news, I will post it. I know this is not that much newsworthy seeing that WNPX-LP analog 20 will be switching from analog 20 to digital 20 soon, but if you are like me and have noticed that WNPX's low power analog channel 20 has been off the air for sometime now and thinking they may be going to digital soon, well, think again. They just filed with the FCC a silent notification. With that notification, they have explained what happened to the station. By the way, the station has been off the air since July 9th. "THE STATION'S EXCITER FAILED AND WHEN A SWITCH TO THE BACKUP EXCITER WAS MADE, IT TOO FAILED. THE EXCITER'S MANUFACTURER, COMARK, DOES NOT HAVE PARTS TO REPAIR EXCITERS. EFFORTS ARE UNDERWAY THRU COMARK AND OTHERS TO LOCATE SUITABLE REPAIR PARTS. IT CANNOT BE DETERMINED AT THIS POINT HOW LONG THE STATION WILL BE OFF THE AIR." If there is any more news, I will post it here. Well, if it is back on the air, then it must be weaker, because I just checked, and I am not getting it at all. Thanks for the update. I checked again today and it is still there. There is a lot of snow but you can see and her it. I am about 25 miles from the transmitter here. Yes, I looked again today and saw a little flash of it before the static took over. I live further out than you do. So, that is the reason I didn't see it at first because I am so far away from it (about 50-60 miles). I want to thank you for the update. I just found out today that WTVF's (NewsChannel 5) parent company is changing "again". The current owner, Journal Broadcast Group, is merging with Scripps Company. A while back, WTVF was owned by Landmark Communications. Then in 2012, They were sold to Journal Broadcast Group. Now, Journal and Scripps are merging. They will be going under the name E.W. Scripps. I am putting a link to the story below. What this means for NewsChannel 5? I don't know. We just have to wait and see. I just saw it for myself. GetTV is now on 30.2. If you don't see it, you may have to rescan the channels to add it. Now we have another channel in Nashville. I am still holding out that we will get an AntennaTV affiliate soon (preferably WKRN). A new network is coming to the Nashville tv channel scape. GetTV is a classic movie channel which is comprised of movies from the 1930s, 1940s, and 1950s. It will be coming to WUXP 30 (rf 21) sometime next month. To look at who they are and what they have, you can click here to go to their website. ABC's Live Well Network, which is currently broadcasting on WKRN 2.3, is coming to an end in January 2015. That means that WKRN 2.3 will possibly be open to a new network. I say possibly because they could axe channel 2.3 altogether. I have e-mailed the station on any response to this development. When I get a response, I will post it here as soon as I get it. I read up on the news on several different news outlets, and there was one news outlet that said, "They (ABC/Disney) are waiting until January to dissolve so that the affiliates will have enough time to find replacement programming." I, myself, would like for them (WKRN) to put on Antenna TV. If anyone has any other ideas or anything else to say, please leave a comment. When I do hear anything else, I will update you here as soon as possible. As anyone else noticed lately that some 480i SD subchannels have changed from 4:3 ratio to 16:9 ratio? It has happened recently first to NewsChannel5+ (WTVF 5.2) and now to Heartland (WSMV 4.2). I am guessing that since both channels are showing repeats of their newscasts, instead of having to cut the sides off, that they want to show them in widescreen format. In the comments section, tell me what your thoughts are about them changing the aspect ratio of the subchannels. I just saw this site. THANKS SO MUCH FOR HAVING THIS. I am not familiar with the verbiage you are using but are you saying that heartland no longer airs their shows in the letter box type format or whatever you call that? if that's the case I might start watching. I hated that it was airing that way. What I mean is that they (WSMV) has now made it possible to where some shows and videos, which were filmed in the last few years, are now able to show them in widescreen format without it being stretched to fit an HDTV. Like when I found out about it, it was "Larry's Country Diner" that was on, in widescreen format, and it wasn't stretched. This might be old news by now, but if there is someone that doesn't receive WRTN 6.1-6.7 (rf 7), Cozi TV is back on WRTN 6.3. I don't know the exact time it came back, but it was about the beginning of last week or sometime in the week before. Also, if anybody does care about it, the info channel is also back on 6.7. Both 6.3 and 6.7 have been nothing but black screens for the past few months. Also, it is still Country Clips on 6.2 where RTV is suppose to be. If anything else happens, I will post it here. Cozi was not on 6.3 May 10 but was there the next time I checked on May 16. It must have returned during that time. It is good to have it back but I miss RTV. At least they are not cutting out part of the show like 31.1 is. Hi, welcome to the new site. I know it is pretty much the same other than looks, but it has a few things different from the old one. For one thing, I have made it more user-friendly with the member's profile page and with the user's comments that are posted with each article. So, I hope you find your way around the site more easily. Also, because it was getting really crowded, I had to dump pretty much most of the archives. I have left only the past few months of articles up on the archive page. Anyone who had a username and password with this site before, they are still good to use. I should suggest once you login, that you should change your password, because of the heart bleed bug. I am sorry it took me so long. So now, when any news breaks, it will be posted here. Thank you for visiting this site, and I hope you find this site to be very informative. There has been something going on with the Nashville tv airwaves as of late. It started Sunday with WPGD 50, WKRP 6, and WJNK-LP Analog 34 going off the air. They are all broadcasting from one tower at the junction of I-24 and Old Hickory Blvd. in northern Nashville. Since then, all of the channels have come back on the air, but WKRP channel 6 is not completely back to normal. From what I have heard, thanks to tomintn, 6.3, where Cozi TV has been for the past few months, is now back to Country Clips and 6.7, the Infomercial channel, is not being shown. I have e-mailed, but I have not gotten a response back yet. When I do, or hear, anything else, I will post it here. Cozi is now on 6-3! Yes! 6-7 is still dark. I am hoping for Antenna TV! Thanks for the update, tomintn. Please keep me updated on any more changes as they are made as I have no access to WKRP at this time. I have just found out that TNN (WSMV 4.2) has now changed its name to Heartland. I looked at their website, and the only other change that I saw was a little moving around of their tv schedule. If you want to look at their website, the website address is www.watchheartlandtv.com. That is all I have for now. I will catch you later. I would like to take this time to thank Jacob Newkirk, owner and editor of JakesDTVBlog.com. For the past five years, he has been covering the TV and Radio landscape of Indiana, Kentucky, and yes even Nashville, TN. He has been the inspiration that made me want to create this website for the Middle TN area. As he starts a new chapter in his life, I want to wish and hope the very best for him. Again, I want to thank you for what you have done over the years. I've just got word that WJDE is back on the air. For a while there, it had been off the air for a few days, but now there's been reports that the signal is coming in great "in Downtown Nashville". I am posting what I found on the AVS forum from "caw1975" below. "It's doing better than ever for me, over in Lockland Springs area. I used to get it in okay, but not great. Couple of weeks ago their transmitter was hit by lightning, and 31.2 was down for a day, 31.1 was down for almost two days. When it came back up, the signal was really low, almost unwatchable, but within the last few days they must have finished the repairs with new and better parts because I've got a great signal now." First off, I would like to say thanks to tomintn for getting this information. Second, he got an e-mail back from someone at Me-TV Network about WJDE adding more power and below is what the e-mail said. "Yes. We are working on that. The station could use a few more watts. " When I hear anything new, I will post it here. Hi, I just got rid of cable and got a DTV antenna. I live in Nashville and could get most channels, but not WJDE. So I wrote to WJDE and got an email back from a TV station in Louisville, KY who told me they have been off the air, but expect to go back on tonight (Sept. 19, 2013). Not sure what that is about or if I will be able to pick it up. Hey, thanks for the heads up DTVDen. Please keep me informed and let me know if they do or don't come back on the air. I have recently learned (from the AVS forum) that WJDE is making plans to increase their power output power early next year. How much? I don't know, but at least it is a start. When I get more details, I will post it here. First, I would like to say that I am sorry for not posting news for the last few weeks, but I have been updating the website. So now, the website accepts users, as in usernames and passwords. Now only users of this website can post comments. I am sorry for having to do this, but the way I had it setup, I was having comments that were advertisements instead of real visitor comments. Now, you can register with the website and start commenting if you want to say something. Again, I am sorry for doing this. Anyways, now to actual news, WNPX (ION) has now added QVC on 28-5. I have been trying to find out something about it, but all I could find was a slight mentioning of it on QVC's Wikipedia page. Which you can find here. So, if anyone else can find something else about it, just let me know. I will try and find some more information if I can. When I do, I will post it here. Thank you for visiting this website.